This online, combined Black Belt and Green Belt training program will teach you Lean Six Sigma process improvement projects from start to finish. Green Belt training will allow you to deliver measurable, sustainable improvement by finding the root causes of problems and streamlining processes. In Black Belt training, you will further develop your process improvement, project management, and leadership skills using clear language and plenty of practical examples. This advanced, interactive and enjoyable online program draws on decades of success helping people from Fortune 500 Companies to Small- and Medium-Sized Businesses. This program will begin to help you create happier customers, increase revenue, reduce costs, and improve collaboration. The fees for the Lean Six Sigma Green Belt and Black Belt Certification exams are included in the program. In this program you learn to complete Lean Six Sigma process improvement projects from start to finish, manage multiple projects, and ensure their alignment to meet organizational goals. 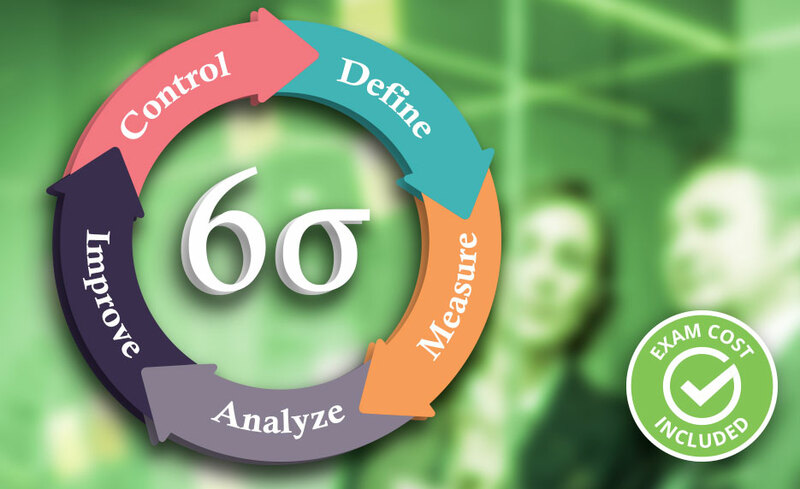 Green Belt Training & Certification is an online, in-depth program that enables you to complete Lean Six Sigma process improvement projects from start to finish. Green Belts can deliver measurable, sustainable improvement by finding the root causes of problems and streamlining processes. Our Online Green Belt Training was developed to meet today’s changing business environments by highly experienced and successful Lean Six Sigma Experts. For decades, we’ve saved organizations in virtually every industry hundreds of millions of dollars. This program draws on what our Experts practice every day in the field to provide you with the most effective way to learn and implement Lean Six Sigma. Black Belt Training & Certification is an online, advanced program that empowers you to lead and mentor Green Belts and plan/execute strategic Lean Six Sigma programs. After completing your Green Belt Training & Certification, you can take the next step and get your Black Belt Training & Certification which will enable you to transform your organization by reducing costs, increasing revenue and improving collaboration. The Black Belt Training & Certification will allow you to manage multiple projects and ensure their alignment to meet organizational goals. As a Black Belt, you can coach Green Belts to complete successful projects that deliver significant, sustainable results. You will communicate and influence people at all levels of your organization to manage change effectively while understanding the why, what and how of statistical analysis tools. Upon completion of this program, you will be prepared for the Lean Six Sigma Green Belt and Lean Six Sigma Black Belt Certification exams. The registration fee for these exams are included with the program. Please Note: A business-related project is required in order to be eligible for the Certification. Projects must be business-related. We highly recommend a project be completed at your place of employment. If you are not employed, a home-based related project can be completed. There are no prerequisites to take this course. However, the Lean Six Sigma Green Belt Certification and Lean Six Sigma Black Belt Certification both require you to complete your own real-world project and an exam to be successfully completed. Certification for each belt level requires a separate project. Please see below regarding sourcing a project. The same process may be assessed for both Green and Black Belt, however, the Black Belt project must use a different metric than was measured and improved in the Green Belt Project. Yes, you will be prepared for the Lean Six Sigma Green Belt and Lean Six Sigma Black Belt Certifications and be able to sit for the exams after successful completion of the course and financial obligation. Upon successful completion of the course, you will be awarded a certificate of completion. In addition, you will be able to sit for the Lean Six Sigma Green Belt and Lean Six Sigma Black Belt Certification exams after successful completion of the course and financial obligation.